A visit to Denia Meeting Point is a must for Backpackers who are travelling along the Costa Blanca. Also a perfect stopping point for hen and stag parties, youth groups, student travellers, and Balearic Island travellers. Located in the very heart of Denia and a only a stone´s throw from the beaches, shops, bars and restaurants. Situated close to the Balearia ferries, bus and train stations. Prices start at only 15 euros per person, with a free breakfast. The hostel comprises of 52 beds: 3 rooms of 6 beds, 2 rooms of 12 beds and 1 room of 10 beds. There are seperate mens and womens bathrooms with large walk in showers. 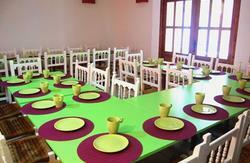 Guests can enjoy the large cafeteria where breakfast is served, and a huge sunny terrace. The hostel is only two years old and totally reformed. All the rooms and bathrooms have been tastefully decorated and are all very modern. Mod cons include, WIFI, Air conditioning, key card system, washing machine and dryer, ironing board and iron, safe deposit boxes, fax service etc. If you are coming from Alicante you have to take the AP7 motorway in the direction of Valencia, if you are coming from Valencia you go on the same motorway, but direction Alicante and follow the sign ´Alicante por la costa´ (Alicante coast road). Choose exit 62 in both cases just before which you will see the sign for Denia-Ondara. Follow the signs to Denia and look for the sign ´centro ciudad´ (town centre). Once you are there look/ask for Calle (street) Marques de Campo at the bottom of which you can park, look for Calle Sandunga which is the 2nd last street on the right coming up from the port and make your way to no. 50 where you will find Denia Meeting Point. If you are coming from Denia railway station you cross a street where there is a car park on the opposite side, you carry along the road to the right of the car park and take another sharp right where you will see the Denia Tourist Office just in front of you, cross the road there and continue a short distance until you see the roundabout, then turn left before it where you will find the Red Cross which is where Marques de Campo ends. You cross Marques de Campos and look for Calle Sandunga no.50 and less than half way down it you will find Denia Meeting Point.